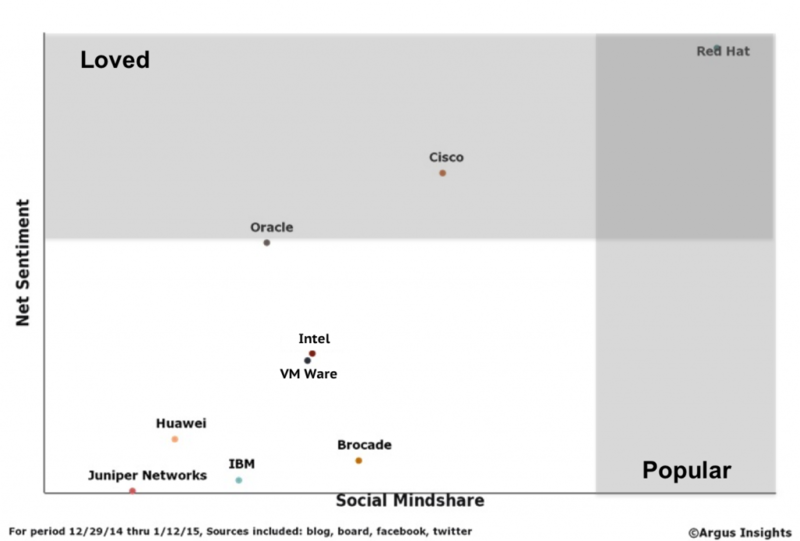 Which SDN / NFV companies are attracting most mindshare ahead of Mobile World Conference? The battle is on for market share, position, alignment, and the right technical solutions in the Software Defined Networks (SDN) and Network Function Virtualization (NFV) markets. Buyers have shifted their behaviors, and now seek information to direct their investments. Social media, events, industry analysts, integrators, outsourcers, and partners all influence budget allocation in this multi-billion dollar market. Your ability to monitor, leverage intelligence, and take action are critical to capitalize on your investments. Argus Insights can tell you if you are positioned correctly to capitalize on the rapidly growing Software-Defined Networking and Network Functions Virtualization (SDN / NFV) markets by leveraging clear insights about your customers, competitors, channels, and impact of events. Argus Insights’ results beat any of our competitors in accuracy, speed, and relevance due to our continuously curated, highly tuned proprietary SDN / NFV model accessible to you now. Discover the breadth of product launches, how you compare to your competitors, the influence of your presence at events, and much more with our near real time monitoring of SDN/NFV conversation. This information is too valuable not to share! We invite you to join us for a free 30 minute webinar on January 27 at 10am PST (to register click here). This exclusive webinar will be hosted the CEO and Founder of Argus Insights, Dr. John Feland. He will provide concrete insights that will aid you in planning your 2015 strategy and investments, and influence your preparation for the Mobile World Conference 2015 (March 2, Barcelona, Spain). Register today to find out who is ahead in SDN/NFV, and why. Please do not hesitate to contact us with further questions. We’re looking forward to starting the conversation!